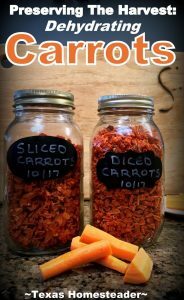 I’ve read that if you blanch the carrots before dehydrating it will preserve the color and taste much better in storage and I can tell you that’s true. As I mentioned, last time I steamed instead of blanching the carrots. I thought steaming would offer the same benefit but apparently steaming isn’t the same as actual blanching. My carrots in storage turned a pale yellow and although they didn’t smell like they’d actually gone bad, they didn’t have that robust carrot aroma. Sadly I had to throw away the ones I had left in the pantry. Have I mentioned how much I hate to waste food?? I’m not gonna make the same mistake this time! So I put on a pot of water to boil and started processing those carrots. I typically peel them because in my experience the peels can have a slightly bitter taste. A quick peeling and trimming the ends and then I plopped them in the bowl. Water on the stove? Still waiting to come up to a boil. While we’re waiting I’ll continue processing those carrots. I don’t want the carrots very big because I’ll be dropping them into my simmering Endless Soup this winter. 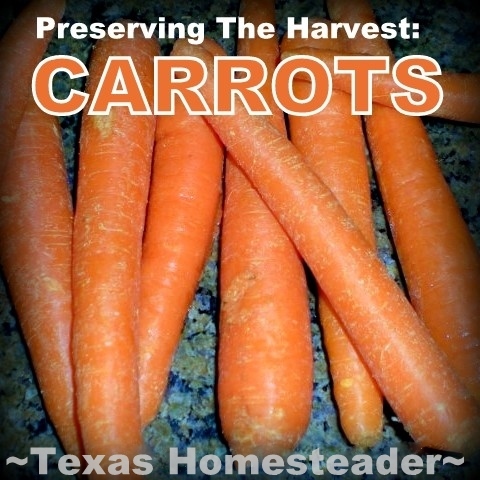 So each peeled, trimmed carrot was then cut into pieces approximately 2.5″ long. Then I split each one in half longways. Now to dice them all up. I want to make them uniform sized so they’ll dehydrate better. Enter my * Vidalia Chop Wizard. 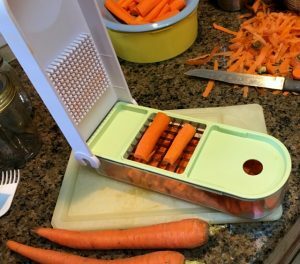 So I take about 20 carrots and dice them using this procedure and I’ve got quite the strainer full now. Surely NOW the water’s boiling? Nope. Dang it takes a long time to bring this much water up to a boil. Well, maybe I’ll go ahead & process another full colander full and make good use of that boiling water… IF it ever boils! You know what they say about a watched pot. I’ll get busy on the second batch. So I lowered my metal colander slowly into the boiling pot and waited for it to come back to a boil. Thankfully that was just a couple of minutes. Then I sat my timer and blanched the diced carrots for 3 minutes. Some instructions say 2 minutes but I went for three. Then I pulled the strainer out of the boiling water and dumped the blanched carrots into an ice bath to stop any further cooking process. I filled the colander with batch 2 and processed it the same. Yep, I’m pretty glad I put that already-boiling water to good use. Heck it took so long to get it to boil the first time – That’s about 20 minutes I’ll never get back again! 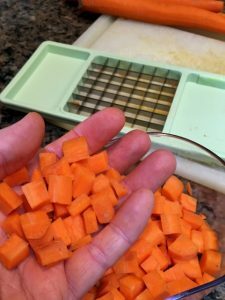 Then I drained all the blanched & cooled carrots and arranged them in a single layer on my *Excalibur Dehydrator trays. After the trays were loaded I slid them into the dehydrator and set the temp to 135. After about 6 hrs I checked on them. Nope, they’re noticeably drier and shrunken, but not completely dry by a long shot. While I’m there I go ahead & rearrange the trays for even drying. Then I checked again in a couple more hours. Nope, not yet. A couple of hours after that they were done. So for me it took about 10 hours at 135 degrees but your actual time will be dependent upon your machine, how thickly you cut the carrots, how long you blanch them and even the humidity where you live. You want to make sure they’re thoroughly dry, hard little rocks. 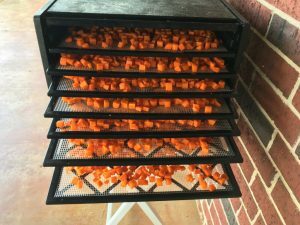 So now that they’re done I bring the dehydrator back into the kitchen and let the trays with carrots sit right there in the dehydrator for a few hours. I want them to be fully cooled just to make sure there’s no chance of condensation sneaking into my jar of dehydrated gloriousness . Then I scoop ’em all up & put them into a quart canning jar. I decided to use these * Reusable Chalkboard Labels to make it easier to see in my pantry. I’d made sliced carrots as well (although I’m not sure I’ll like them as well) so these labels really help me see which jar is holding the carrots I’m looking for. If I use all the carrots and decide to put dehydrated onions in that jar next, I simply wipe the label clean and write the new contents. Yeah, I love these labels! Can you believe that mountain of carrots fit in these two little jars? Me neither! As I mentioned earlier if I’m making soup I’ll probably drop them directly into the simmering broth as long as it will be simmering 15 minutes or longer. Otherwise I’ll use them as a veggie side. It’s easy, I’ll rehydrate them by pouring boiling water on them and letting them sit covered for 15-20 minutes until they plump back up. My plan is to season them lightly with salt & pepper, a small pat of real butter and some minced fresh rosemary from the garden. I sometimes buy 50 pound sacks of carrots–I’m a big fan of juicing. And a few go to my horses as bribes–er–treats. So this is a good thing to know about how to dehydrate them. If you do any juicing, you can use the leftover pulp to make crackers in your dehydrator too. Thanks for the instructions! Hi Tammy, I never had dehydrated vegetables. Do they really taste good rehydrated and eaten on their own oe do they need to be mixed into something to hid them a bit? Thanks.